Nebelung cat breed information and advice. Nebelung cats are stunning, semi-longhaired cat breed with an unusual silky blue coat. The Nebelung is a stunning and relatively new semi-longhaired cat breed with an unusual silky blue coat and Russian Blue-type. The fur is often silver-tipped which makes it look as if it shimmers in the light. Founded in America by breeder Cora Cobb, the Nebelung breed started with two cats, Siegfried and Brunhilde. Cara admired the beauty of her cats', who both had the appearance of Russian Blues but with semi-long fur - it is their fur that now gives the Nebelung their defining breed standard. 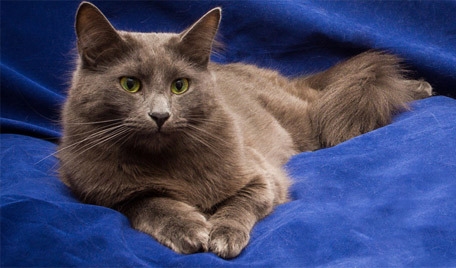 The breed was first presented to the Governing Council of the Cat Fancy (GCCF) at a Russian Blue cat breed show in 2011. Read more about the Russian Blue cat breed. The Nebelung is a sturdy, well-muscled cat with slender legs and tufted paws. The blue fur is of a medium length all over the body, with a thick tail that tapers to form a bush. Males may have more of a ruff than females, and generally weigh more too. Highly intelligent Nebelungs are affectionate and love the company of humans, other cats and dogs. They are said to bond well with their human family, although they can be shy with strangers. As an active, intelligent and athletic cat, Nebelungs require mental and physical stimulation and exercise. As a hardy and healthy breed, there are no known diseases in the breed, although they do tend to be big eaters so owners will need to be careful to ensure their cats do not overeat and gain weight. The Nebelungs soft and silky coat will require a gentle weekly groom to ensure the double layer coat does not matt.